Mark Papermaster, who was released from Apple following the ‘Antennagate’ non-issue, has scooped up one of Apple’s chief CPU architects, Jim Keller. Keller is a pretty big deal at Apple, where his job is listed as the A4/A5 Designer & K8 Lead Architect. 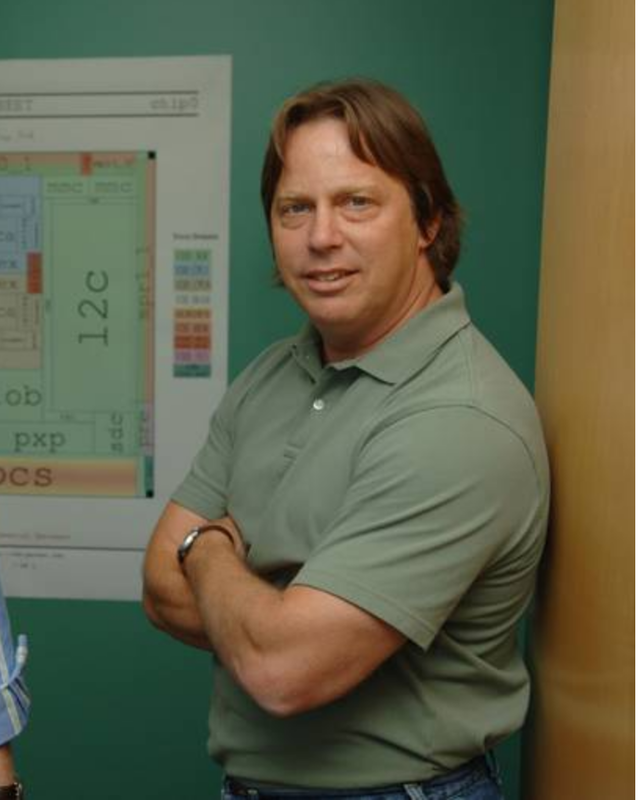 Keller, picture right in 2005 at PA Semi, came to Apple as part of the PA Semi acquisition in 2008, and he would have worked under Mark Papermaster during his tenure at Apple until Papermaster’s release in 2010. There is clearly no non-poaching agreement between the two companies — earlier this year a chip expert John Bruno departed AMD for Apple. Coincidentally, Apple recently moved from AMD discrete GPUs in its MacBook Pros back to NVIDIA. Keller was most recently a director in the platform architecture group at Apple focusing on mobile products, where he architected several generations of mobile processors, including the chip families found in millions of Apple iPads, iPhones, iPods and Apple TVs. Prior to Apple, Keller was vice president of design for P.A. Semi, a fabless semiconductor design firm specializing in low-power mobile processors that was acquired by Apple in 2008. While there, he led the team responsible for building a powerful networking System on a Chip (SoC) and its integrated PowerPC processor. Keller previously worked at SiByte(R) and Broadcom as chief architect for a line of scalable, MIPS-based network processors that supported 1Gig networking interfaces, PCI and other control functions. Before Broadcom, he spent several years at AMD, playing an instrumental role on the design team responsible for the groundbreaking AMD Athlon(TM) 64 and AMD Opteron(TM) 64 processors, which featured the world’s first native x86-64 bit architecture. SUNNYVALE, CA, Aug 01, 2012 (MARKETWIRE via COMTEX) — AMD announced today that Jim Keller, 53, has joined the company as corporate vice president and chief architect of AMD’s microprocessor cores, reporting to chief technology officer and senior vice president of technology and engineering Mark Papermaster. In this role, Keller will lead AMD’s microprocessor core design efforts aligned with AMD’s ambidextrous strategy with a focus on developing both high-performance and low-power processor cores that will be the foundation of AMD’s future products. Keller co-authored the widely adopted HyperTransport specification, as well as the innovative x86-64 processor instruction set, which is used around the world today in hundreds of millions of desktop, notebook and server systems. Jim was a corporate consulting engineer at DEC, and architected two generations of Alpha processors during his tenure there. He holds a Bachelor of Science degree in Electrical Engineering from Penn State University. About AMD AMD AMD -0.98% is a semiconductor design innovator leading the next era of vivid digital experiences with its groundbreaking AMD Accelerated Processing Units (APUs) that power a wide range of computing devices. AMD’s server computing products are focused on driving industry-leading cloud computing and virtualization environments. AMD’s superior graphics technologies are found in a variety of solutions ranging from game consoles, PCs to supercomputers. For more information, visit http://www.amd.com .